HOUSTON (AP) After losing just one game in November the Houston Rockets are feeling pretty good about where they are. But James Harden says the best part about how well they’re playing is that they can be much better. The Rockets improved to 12-1 this month, with the only loss coming on Nov. 14 against Toronto, and their 17-4 record overall is the best in the Western Conference. Trevor Ariza made a 3-pointer in that stretch and Ryan Anderson added two finished with 19 points. Young finished with 23 points for the Pacers. They have won seven of their last 10 games. Houston led by 18 after three, but Indiana scored the first seven points of the fourth to get within 89-78. After a timeout, Chris Paul hit a 3-pointer right before the shot clock expired to give the Rockets their first points of the quarter before he found Ryan Anderson for a rare dunk to make it 94-80 with about nine minutes left. 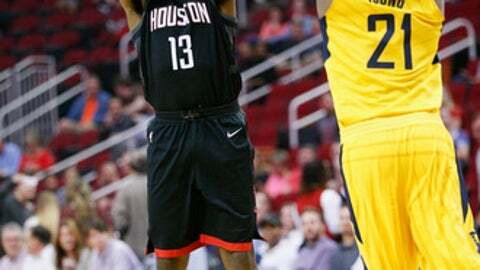 The Pacers tied it early in the third quarter before Houston used a 13-4 run to take a 67-58 lead with about seven minutes left in the quarter. Anderson and Trevor Ariza made consecutive 3-pointers to power that run and Ariza added a second 3 later in that span. Indiana got back on track after that, and used a 6-2 spurt, highlighted by a 3-pointer from Bojan Bogdanovic, to get to 69-64. But Houston scored the next eight points, with the last seven from Harden, to push the advantage to 77-66 with about 2 1/2 minutes left in the third. Victor Oladipo ended an almost 2 1/2 minute scoring drought with a 3-pointer after that. It was then that the Rockets got hot from long-range with P.J. Tucker and Harden making two 3s each to allow Houston to outscore the Pacers 12-2 for the rest of the quarter to make it 89-71 entering the fourth. The Rockets led 54-49 at halftime. Pacers: Oladipo played despite dealing with a bruised right knee. He finished with 19 points. … Bogdanovic added 15 points. … Myles Turner had 15 points, 10 rebounds and four blocked shots. Rockets: Nene returned after missing one game with a strained right shoulder. He had one point and four rebounds in 10 minutes. … The Rockets improved to 4-0 this season when all five starters score at least 10 points. … Clint Capela had 22 points and 13 rebounds. Pacers: At Toronto on Friday. Rockets: At Los Angeles Lakers on Sunday.